the hit graphic novel series! Based on yesterdays comments, many of you saw the monster coming. But did anyone guess that Marcos Stamatis was roommates with Doug Hiro? “Battle Beasts” by Jerzy DrozdIt cannot be overstated how important shiny hologram stickers were to kids of the 1980s. Between Lazer Blazers , Visionaries, Super Naturals, and even the Transformers Mini Spies (okay, not quite a hologram, but a super cool sticker feature), it seemed that the future had arrived and it was all holograms, all stickers, all the time. This is one reason I’m glad the Astronaut Academy books have the shiny foil covers, by the way. It really hearkens back to the shininess of 80s toy properties. During this time Hasbro came out with a brilliant way to monetize the paper/rock/scissors game. They just put shiny heat-reactive stickers (just like the TF Mini Spies) on some cool monster figurines. What was once a free game on the playground became a gotta-catch-em-all merchandising machine. There were even Battle Beast Chariots and playsets. But if you’re anticipating an essay on the murky waters of merchandising and exploitation of what was once an innocent game, I’m sorry to disappoint you. As a grown man who is hopelessly addicted to the Skylanders game, I respect, love, and fear clever merchandising strategies. I know they’re picking my pocket, but I don’t care as long as they’re providing me with a super-fun experience! What interests me about things like Battle Beasts is how they hooked us in with a simple play feature and left it to us to make up the rest. Outside of an apperance on the Japanese Transformers series (and there’s my second Transformers insert), and a handful of comics that I never got to read, there wasn’t a lot of information for us to glom onto in regards to what the story was. All we got were the “Wood!” “Fire! Fire burns wood!” dialogue exchanges in the commercials. My friends and I collected the figures, but we seldom found ourselves playing in the sandbox with them beyond the paper/rock/scissors game described in the commercials. But when I was left on my own with the toys I had to wonder: what was the story behind these guys? Again I’ll point out that we didn’t have much to go on besides the message in the commercials, and that is what I ran with. “Collect every one of these incredible creatures and battle for fun!” One of the later commercials introduced the tag line “Battle Beasts! Battle for the fun of it!” Which I heard as “Battle Beasts battle for the fun of it!” Ah-ha, I thought: these guys are intergalactic professional wrestlers, who are all friends outside of the ring! That became my play story when goofing around with the figures. I can’t remember what names any of them had, or any that I made up for them, but I do remember making up different personalities for each character based on their element/animal type/expression. That’s what makes a lot of these arguably cynical merchandising plays so memorable and fun, at least for me. They gave us just enough information to activate the imagination and set us off to create our own worlds for these figures. I’ve known plenty of people who report that they mixed and matched their Battle Beast figures with other toys in their collection to make up their own stories and worlds. And anything that gets kids excited about imagining things is cool by me! A quick search or two on the web reveals a ton of Battle Beast fan sites, fan comics, and videos. People are still building their own stories about these characters! But I’m happy to keep thinking of these guys as cheerful wrestler types who use their powers to create entertaining battles, after which they all go out to the juice bar. 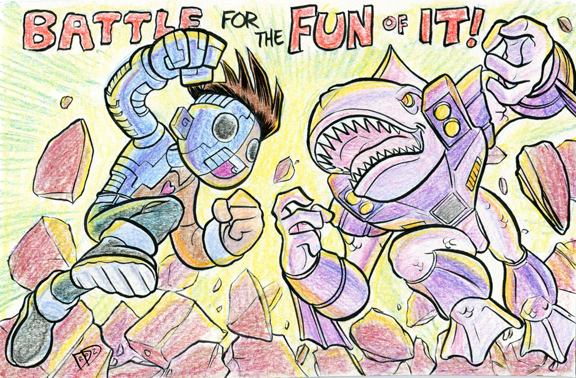 And I’d jump at the chance to draw a crossover event where the kids at Astronaut Academy have to participate in a Battle Beast championship tournament. Jerzy Drozd is the author/illustrator of The Front and several other graphic novels & comic series. He is the host of the popular Comics Are Great podcast/video show and co-host of Kids’ Comics Revolution! In June 2009 he began serving as the programming director for the annual Kids Read Comics celebration, an event he co-organized with teen librarian Edith Burney, DC Comics writer Dan Mishkin, and Green Brain Comics store owner Dan Merritt. Check out his Ignite Ann Arbor talk about why comics are so great!